Fee based financial advisers take a holistic approach to developing a financial plan. 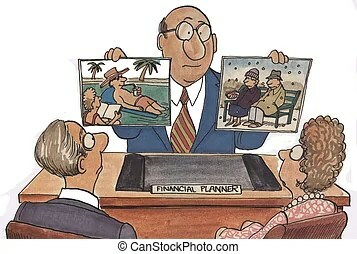 In contrast, I am surprised by how many Investment Advisers take a very limited approach and do little or no financial planning. Far more than just investments, they can look at estate issues, tax situations, current and future income needs, and even insurance. For those who are not ready for Do It Yourself investing, and for whom a Robo Adviser doesn’t meet their needs, a Fee Based Adviser may be well worth the investment. For retirees who are in the decumulation phase (ie spending phase) of investing, which is far more complex than the accumulation phase because of the need to generate income and minimize taxes, a Fee Based adviser may be the answer. What can you expect a Fee Based Adviser/Planner to do ? For starters, you can expect them to take an unprejudiced approach to providing advice. That means that they will not be influenced (as some financial advisers are) by the amount of money that they will make from the companies that they recommend. Investment advisers/advisors who are commission based can be biased because of the need to make an income or meet corporate targets. And please note that an Advisor with an “o” is not a registered Adviser with an “e”, at least in Canada, believe it or not. An Advisor is basically a licensed salesperson. Beware. Check his or her business card. You should also demand that Fee Based Advisers/Planners take a holistic, that is a total, approach to your personal situation. They will look at your tax situation, your pension income, your health, your dependents’ health, your lifestyle, and your retirement dreams. You can expect a full review of both your assets as well as your projected expenses, for the rest of your life. As always, readers are reminded to conduct their own due diligence and/or seek the advice of a registered financial adviser/planner.